Get rid of the binders and books and experience the freedom of going digital. MobileSheets gives you the features you need to manage your library with ease and perform at your absolute best. Powerful filtering capabilities let you find the songs and setlists you want in seconds. Using voice search, you can even speak the song you want! With support for nearly 20 fields, you can organize your library with the information that is important to you. Mark up your music with drawings, shapes, text and stamps. With support for multiple layers, you can also toggle between groups of annotations. Group your songs into setlists for performances. Page through each song seamlessly. Manage your setlists with an easy-to-use editor with drag and drop support. 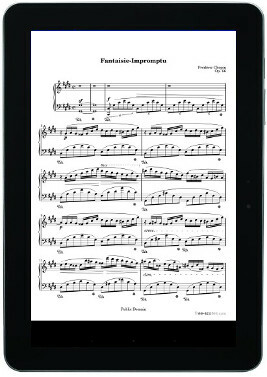 Turn pages with bluetooth or USB pedals, or take advantage of the automatic scrolling feature. Pedals can be set up to drive other actions too. Choose between horizontal scrolling, vertical scrolling, half pages in portrait, or two pages at a time. Additional display settings provide customization to meet your needs. 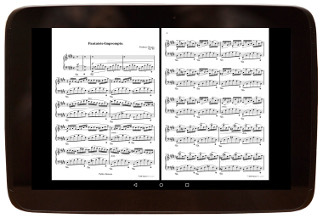 A free companion application lets you manage your tablet library from comfort of your PC. Backup your MobileSheets library to your PC for peace of mind. A built-in metronome, custom audio player for backing tracks, MIDI support, automatic cropping, support for dropbox, bookmarks, link points... the list goes on! Need a bluetooth page turner? Click here for a great selection.